The Urban Land Institute's Urban Open Space Award competition recognizes outstanding examples of successful public spaces that have "socially enriched and revitalized the economy of their surrounding communities." We couldn't wait to learn more about these projects and how they revitalized their surrounding downtowns. Read on to catch a peek at the six most innovative urban spaces of 2015. Including the water body, Marina Bay comprises nearly 140 acres -- including a 2-mile loop with a tiered waterfront promenade, two pedestrian bridges, an event plaza and open spaces. Located in the heart of Singapore's city center, this stunning urban space extends a thriving central business district that's been in the making since the 1970s. Designed by Urban Redevelopment Authority, Singapore, the space now includes a mix of commercial, residential, hotel and entertainment uses, along with public spaces and parks. Providing an enjoyable setting for work and play, Marina Bay also easily connects to other open spaces, including Singapore’s latest attraction, Gardens by the Bay, which has increased the urban space within the city by another 247 acres. 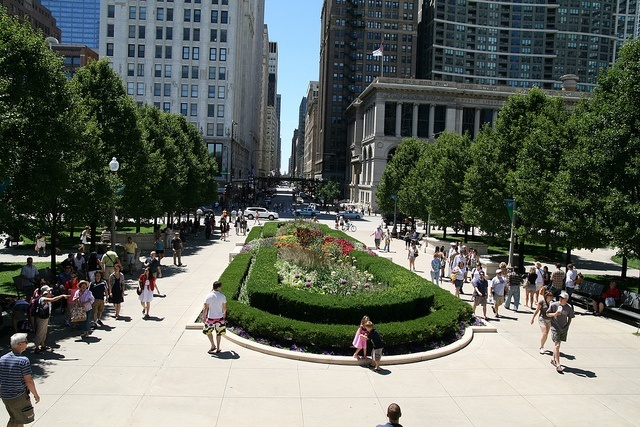 In 1998, then-Mayor Richard M. Daley established a partnership with Chicago’s philanthropic community, the Millennium Park Foundation, and together they produced Millennium Park which opened on July 16, 2004. Located at the corner of Grant Park, the space transformed 16.5 acres of rail lines and a surface parking lot -- and another 8 acres of shabby park land -- into a gorgeous outdoor environment that makes the most of the space. At least 10 designers at art firms contributed to the park, including McDonough & Associates. Now 10 years old and still going strong, the space hosts around 80 concerts and 5 million visitors a year. And two art installations that call the park home -- Anish Kapoor’s Cloud Gate Sculpture and Jaume Plensa’s Crown Fountain -- are now Chicago’s sculptural icons. Between 2009 and 2011, Oklahoma City, in coordination with the Myriad Gardens Foundation and Alliance for Economic Development, invested over $42 million to completely transform the Myriad Gardens. Before the big transformation, the 15-acre space was rundown and rarely used. The partners decided to completely redesign all outdoor areas of the space, as part of the renaissance of Oklahoma City's downtown. The park now attracts more than 1 million visitors a year and includes: a children’s garden and playground, performance stages, a Great Lawn for relaxing, interactive water features, restaurants, a seasonal ice rink, outdoor seating, and native plant and ornamental gardens. This massive 286-acre park system "represents a defining infrastructural success," the Urban Land Institute says. The space is located in the bustling financial district of Nanhai in Guangdong province. Although many areas of its type become “empty towns,” where people come for work and leave shortly after, the district's planned urban development has turned it into a thriving place to live, work and play. Investors, new residents and tourists flock to the district for its celebrated Thousand Lantern Lake Park, now synonymous with the city’s identity. Sited on land reclaimed from old industrial uses, the park system features “Big Water” features that connect all new city blocks with a system of lakes, grand canals and water alleys. Shaped by extensive public participation, Tongva Park and Ken Genser Square in Santa Monica embody the city's active outdoor lifestyle while incorporating biodiversity, culture and pathways that physically connect central downtown districts. "As a whole, the project offers a new model of sustainability for similarly scaled projects– one that carefully balances environmental and cultural considerations," the Urban Land Institute says. "From abandoned parking lots to the largest-scale Mediterranean meadow garden of its complexity in a public space, Tongva Park and Ken Genser Square have restored valuable ecosystem services and social vibrancy to a once derelict and degraded urban site." 6. Washington Canal Park, Washington D.C.
One of the first parks built as part of the District’s Anacostia Waterfront Initiative, Canal Park "presents a model of sustainability, a social gathering place, and an economic trigger for the surrounding neighborhood," Urban Land Institute says. Located on 3 acres of former parking lot, this 3-block-long park is sited along the historic former Washington Canal system. The design evokes the history of the space with a linear rain garden and three pavilions reminiscent of floating barges. The rain garden also functions as an integrated stormwater system that is estimated to save the city 1.5 million gallons of potable water per year.